The Sunday Torygraph has started doing these. I seem to remember remember someone doing them a few years ago. The ones in the paper are a bit easy - so I thought I'd put up a harder one. The sums below are in the top left hand cell of each cage. This needs quite a lot of work - at one stage I thought I would not be able solve it. I'm not sure what your rules are. Are the following definitions and constraints correct? A cage is a specified group of cells which is connected orthogonally, i.e. each cell in the cage can be accessed from any other via a series of vertical and/or horizontal one-cell moves within the cage. All the cages together comprise the entire puzzle, i.e. every cell is in one cage. No digit is repeated within a cage. Every cage has an upper left cell. For example r4c5, r5c4, r5c5 would not constitute a legitimate cage, because there is no upper left cell to write the sum in. This leads me to question my interpretation of the axioms, especially the last one. Perhaps it is OK to have a cage with no upper left cell. In that case, where is the sum written? Is it in the leftmost cell in the top row, or in the topmost cell in the left column? Note that these two are not the same. Your last bullet point is wrong. The sum is in the left-hand side of the top row. Row is considered to dominate Column. I should have pointed that out. Indeed for clarity - I should have made the other points. An important point is that no single cell cages are allowed. The full cover one is not absolutely necessary as you can add up the cage sums to get 405 (Simon pointed this out on the Assassin forum). I was wondering about that. Allowing single-cell cages would have seemed to reduce the beauty of the puzzle a bit. It did occur to me to add the sums, and this one was indeed 405, so I already knew this was the case in this particular puzzle. I was wondering if this was a general rule in puzzles of this type. simon_blow_snow suggested ignoring the single cage constaint in order to make them harder. I'm not sure if this one solves that way - but it is in all likelyhood unique. I would suggest doing this with the newspaper ones as they are significantly easier than this one. If anyone does cageless killers this way and finds multiple solutions please post, as from my KiMo stuff this is an interest. HATMAN wrote: simon_blow_snow suggested ignoring the single cage constaint in order to make them harder. Yes I did suggest that but on some second thoughts I think it would be too evil to try solving it that way. The only point to do it (probably required a lot of forcing chains or trial-and-error attempts) is to prove its uniqueness without that constraint. Would anyone like to try (not me)? No, thanks. I'm having enough trouble as it is. After working on it on and off for a couple of days, all I have been able to fill in is the right-hand three columns (minus 5 naked pairs). And in fact, without that constraint, in general it does not follow (I'm sure) that there would still be only 1 solution. In this puzzle, that constraint was invaluable to me in solving the two-cell 4 in the right center box. I've made a cageless killer which loses the top left cell constraint. So the cell in which the number is, is just in a cell which is part of the cage. I think it worked out well. 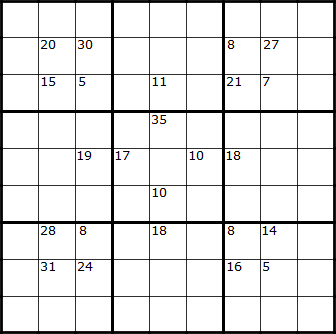 In this Killer Sudoku the cages are hidden. Each cell with a clue number is part of a seperate cage. Each cage consists of orthogonally connected cells. The number indicates the sum of the digits in those cells. No digit can repeat within a cage. Cages consist of at least 2 cells. No two cages can overlap. Lovely puzzle so far - took me ages to find the starting point - but then it flows well. Just starting my third attempt - mistakes & mistakes. I also enjoyed your X Sums Sudoku, nice concept and a very pleasant example. PS have you tried my Diamond Killer or my Kenyan Killers (on the assassin site)? Yeah, I have done the diamond killer. It gave me headaches, but was fun to work out though. It is a good idea though. It was something I thought might be worth exploring for a competition scenario as well. The Kenyan Killers I haven't tried yet. I'm not too much of a fan of these kinds of variants.